Iowa’s unemployment rate in May stood at 3.8 percent, unchanged from April. 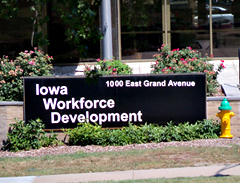 Iowa Workforce Development spokesperson Ed Wallace says the state’s jobless rate was 4.4 percent one year ago. “Right now, Iowa’s total employment is almost 20,000 more than last year,” Wallace said. Iowa’s manufacturing sector trimmed 3,200 jobs in April, but added 1,700 jobs in May. “We are seeing a big rebound in manufacturing as durable goods orders are up,” Wallace said. Financial services added 900 jobs in May following declines in March and April, while professional and business services added 700 jobs. Leisure and hospitality added 400 jobs and Wallace credits gas prices. “More Iowans have discretionary income in their pockets as the result of lower fuel prices,” Wallace said. In April, the total number of working Iowans increased to a record 1,647,700. There was a slight decrease in that number in May. “The total number of Iowans employed (in May) was 1,645,800,” Wallace said. “The number of unemployed Iowans was 64,700.” The U.S. unemployment rate rose to 5.5 percent in May from 5.4 percent in April.